Sometimes my cat likes to do what I call “Having a Yack Fest” right there on the carpet, generally without fail this occurs when I have company over. Luckily, Resolve Pet Oxi Advanced Stain Remover Model 1920078033 comes to the rescue! Anyone with pets knows that sometimes they can be a bit messy, and as I mentioned my cat Roderick is no exception. So it was with a heavy, slightly annoyed heart that I set about in search of something that can at least help to make my carpet look like Roderick doesn’t have his little hairball problem. I tried several carpet spot cleaners but became a loyal customer when I found this wonderful Spot Cleaner of the Gods. Resolve Pet Oxi Advanced Carpet Stain Remover Model 1920078033 claims to have a new unbeatable formula, removing tough pet stains and freshening with a light, clean scent. 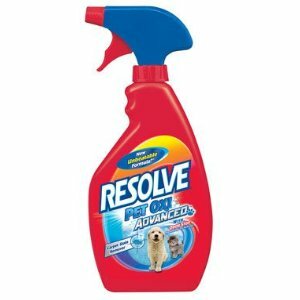 Obviously developed for pet owners and the spots they encounter, I have to say that whichever genius they have mixing chemicals to keep our homes spotless over at the Resolve labs his the nail on the head with this one. Even some of the toughest spots I’ve been able to have completely disappear with just a litte Resolve Pet Oxi Advanced on the carpet and some scrubbing with a wet rag. As the solution dries it completely eliminates any traces of there having been a problem. At around five dollars a bottle, you can’t go wrong with it. Now of course there are a couple drawbacks. Before the spots have dried I have been known to accidentally walk through a spot, making my socks cold and wet. Also, the supposedly light, clean scent, though clean smelling, is a little sickening in a “chemicals-disguised-as-fresh” sort of way. Also, stooping down with a wet rag and scrubbing furiously can be a bit taxing on the ol’ lower back, but I suppose that’s really not worth mentioning unless you have a maid that simply refuses to do so, in which case I’d say you might have a problem bigger than pet stains. Overall though, as mentioned above I don’t see how for the low cost, you can find a better spot treatment solution that Resolve Pet Oxi Advanced Carpet Stain Remover Model 1920078033. I always keep a bottle handy just in case, and I’m sure Roderick must not feel quite so guilty when he walks in the room the next day and is able to completely forget the horror of the night before. Oh no, there he goes again!